Based in Chongqing, Chinese company Century Cruises is a division of the Chongqing New Century Tourism Group, founded in 1999. In 2003, the company entered the Yangtze River cruise market with the launch of its first ship, Century Star and has since launched six more vessels. Initially Century sold its cruises to the European and Southeast Asian markets, before expanding into the U.S. market, partnering with tour operators such as Avalon, Uniworld and other China specialists. The company has the Yangtze River's most modern fleet, with all vessels built after 2003 and the latest ships launched in 2013. Designed and operated specifically for Western passengers, Century Paragon is owned by Century Cruises, which has a fleet of seven modern vessels on China's Yangtze River. One of the most modern vessels on China's Yangtze River, Century Legend caters specifically to western passengers and is often chartered by Uniworld and Avalon. Boasting the youngest fleet on China's Yangtze River, Century Cruises has seven vessels that are often chartered by major river cruise lines such as Uniworld and tour operators like Wendy Wu. Much larger than ships on European rivers -- which are restricted in size due to the height and width of bridges and locks -- the vessels have up to seven decks and amenities including a hair and beauty salon, fitness center, library, medical room, laundry, elevators and, on the most recent ships, a cinema and large indoor swimming pool. The onboard atmosphere is relaxed, and there is no formal dress code. Passengers wear practical clothing in the daytime, with comfortable walking shoes and layers for excursions. In the evening some men opt to wear a jacket and tie, and some women change into dresses and smarter clothes, but this is not required. Chinese and Western-style dishes are served onboard, and special diets can be catered for with advance notice. In addition to the main restaurant, the newest ships feature an a la carte restaurant for passengers in suites, along with butler service. Additional perks in the Presidential Suites include room service. In addition to port talks and musical entertainment, onboard activities reflect the Chinese culture and include tai chi and mah-jongg lessons. Beds are 6 feet 6 inches long with high-quality cotton bed linen. Cabins have either a shower or bathtub and shower, and some have fridges and mini-bars. Standard amenities include individual climate control, sofa, desk, hair dryer, flat-screen TV and bottled water replenished daily. The onboard electrical current is 220v, with continental two-pin or three-pin plugs. The majority of guests are from English-speaking countries. They are well-traveled and want to sail the Yangtze in style, while having an authentic experience and exposure to local food, customs and culture. The company's seven vessels carry 186 to 398 passengers, with the emphasis on Western-style amenities and comfort. European naval architectural firm Yran & Storbraaten designed the newest vessels, which has worked with Disney Cruises, Seabourn, Holland America, Viking River Cruises and others. 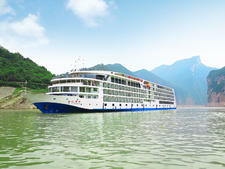 Century Cruises specializes in sailings that travel three nights downstream and four nights upstream, all on the Yangtze. Highlights include excursions to the Shibao Pagoda and the Three Gorges Dam, a transit through the dam and cruising through the Lesser Three Gorges region. 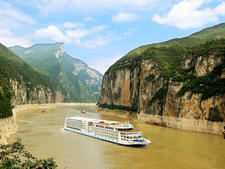 It also offers seasonal winter itineraries, including a 10-night cruise from Chongqing to Shanghai. Constructed in 2003, the company's first ship was the 186-passenger Century Star, with three categories of cabins ranging in size from 236 square feet to 796 square feet. The 306-passenger ships, Century Sky and Century Sun, followed in 2005 and 2006 respectively. These ships also have three categories of cabins, ranging from 278 square feet to 383 square feet. The Century Diamond was launched in 2008, followed by the Century Emerald in 2010. Both carrying 264 passengers, the near identical vessels offer four cabin categories ranging in size from 269 square feet to 839 square feet. All ships are well equipped with spacious public areas, airy atriums and amenities that include a salon, fitness center and medical room. The newest and most luxurious vessels in the fleet are the sister ships Century Paragon and Century Legend, both launched in 2013 and carrying 398 passengers. Standout features include staterooms on the sun deck, a rarity in river vessels, and a 2,153-square-foot heated indoor pool. The majority of cabins on all vessels have private balconies, apart from those on the lowest passenger deck that have fixed panoramic windows.